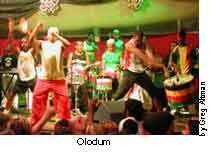 This afro-Brazilian drum-dominated group is officially known as Grupo Cultural Olodum. As with some other groups that have been around the Bahia scene for a long time, they are a collective that uses the money they make to help promote community programs and social movements. What they do best though is get up and pound out resonating rhythms that mix African, Samba, Latin, and Reggae styles. Ever notice how the opening track from Paul Simon’s “The Rhythm of the Saints” sounds a bit different, a lot more ‘wow’ than the rest of the album? Well, that drum track was recorded by Olodum, right here on the streets of Salvador, Bahia. During Carnaval, the makeup of the group changes per procession, from one with a large collective, to others with just a group of about a dozen playing atop a trio electrico. These are the mobile audio blasting units at Carnaval that probably could be heard from outer space. If you’ve never experienced one, picture a tractor-trailer with the sides blown out, and the innards crammed to the gills with speakers, amplifying equipment, and giant generators. Olodum’s is more stripped down and less gaudy than the rest of the bunch here (Salvador’s Carnaval sported about 50 this year), proclaiming itself as “A Nova Tenda Dos Milagros.” Perhaps inspired by a George Amado novel, this seems to mean that they are a new house of miracles. The front line before the trio carries signs with the pictures of past miracle workers from the region. Performing their weekly concert at the “Reggae Bar” in Salvador’s Pelourinho, fun seems to be much more of a priority. 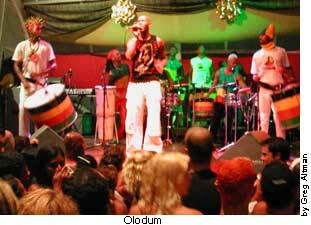 The group’s two drummer frontmen set the tone with a characteristic Olodum low tone beat on their large hip hanging drums. Every so often they hold them up high and pound them over their heads. These two flank one of three singers for the group who stand before a group of percussionists and musicians. Things really get going when the group launches into my personal favorite, “Tequila boom-boom.” Regulars in the crowd go about leading coordinated dances every so often. Later on the sounds mellow out and take on a more reggae swing. Reggae seems to be the adopted second musical language in Bahia, you can hear it everywhere in the streets, and its influence comes to the surface with most performers at some point. Around midnight the show ends, and you file out sweaty, head throbbing, and wanting more.